We Are looking for information/documentation that places the 97th Infantry Division at Flossengurg Concentration Camp at time of liberation. We are attempting to get the 97th Infantry Division flag placed in the National Holocaust Museum as part of the liberating commands. Please contact Bob Rowland if you have any information. Company Pictures may be seen here. 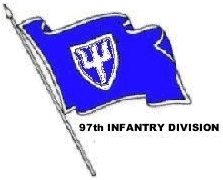 Click on 97th Division Flag at top of Page to Enter Site.